One Dyno Pull is worth a Thousand expert opinions. 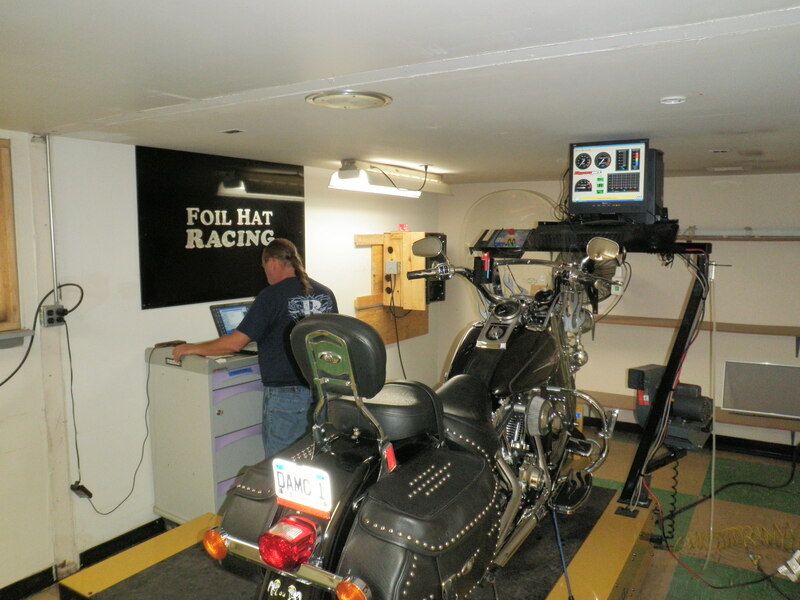 Located in Horsham PA just north of the WillowGrove exit of the turnpike Foil Hat Racing has the top of the line Dyno Jet motorcycle dynamometer! When it comes to everyday Motorcycle Dyno Tuning performance measurement, problem diagnosis and precision tuning, our Dynojet 250i Inertia Dynamometer offers fast, accurate and repeatable solutions. Our trained staff will run diagnostics on your bike and provide you with a detailed printout of your bike’s peak performance. Our program writes the map in real time as your bike is being run and put under load. The result is a bike that runs at it’s peak, for the options you have installed and that your air fuel ratio is as close to optimal, for the selected components you have chosen. Today’s Dynojet dynamometer does so much more than tell horsepower and torque. It can look into your motorcycle and see things like fuel mixture, cam timing, clutch slippage, how loose or tight your drive chain is and whether or not it needs to be replaced, how your sprockets are holding up, whether your cush drive is worn, if your fuel needle needs to be adjusted, if your bike needs a tune-up, a valve adjustment, and even if your speed or your tach are calibrated properly. The motorcycle dyno tuning dynamometer has also made a huge impact on the racing industry. It has become the industry standard and a shop without one, simply cannot provide the state-of-the-art technology and service that a shop with one can. One Dyno Pull is worth a 1000 expert opinions Let us show you why!